If your browser does not support Google Earth’s plug-in, you’re out of luck if you’re waiting for the Google Street car to arrive - this spot is simply too remote. Fortunately, the British Landscape Club have got there before you. At the head of a remote valley and at the heart of the Snowdonia National Park, this Welsh lake sits at the centre of an eroded away dome - the Harlech Dome - of buckled rock that once bridged Snowdon in the north to Cader Idris in the south. 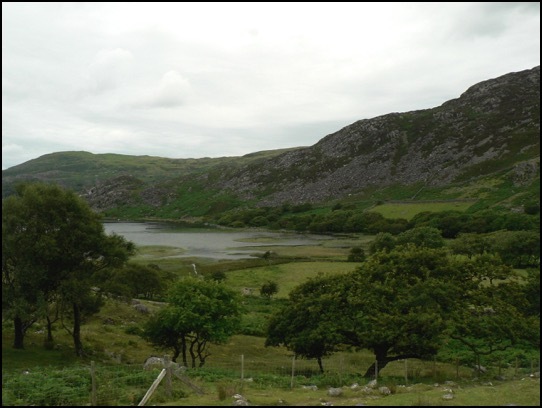 The lake is fed by the Afon Artro stream, the valley of which provides a mean transport corridor, enough for a hairy single track most of the way up from the village of Llanbedr on the coast road near Harlech. There’s a full account of its wonders in the Club manual, The Lie of the Land by Ian Vince, but all you need to know is that there’s a car park, a portaloo and moments of unfettered wilderness and blissful peace around this amazing spot.